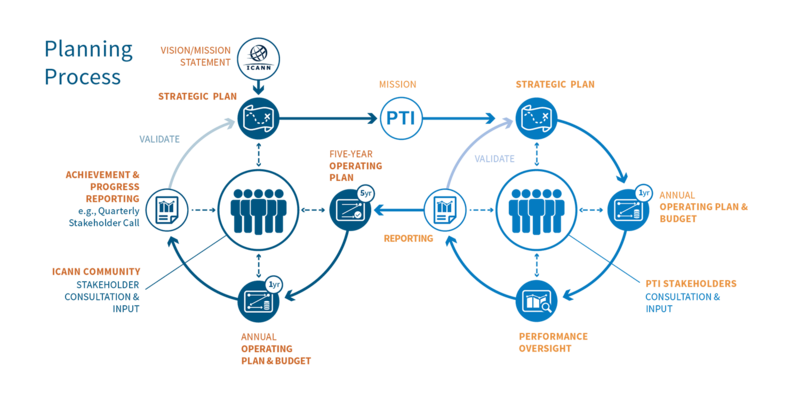 ICANN's Planning Process cycle has a threefold approach encompassing a Strategic Plan, a Five-Year Operating Plan, and an Annual Operating Plan & Budget. The cycle culminates with Achievement & Progress Reporting. The Five-Year Operating Plan is a new addition to our planning process and is in response to the public's comments. Strategic Plan – Developed with community input and updated every five years. Designed to shape ICANN priorities, inform its budget and drive activities. ICANN Strategic Plan for Fiscal Years 2016-2020 [PDF, 1.64 MB] | Mobile Accessible [PDF, 408 KB]. Watch a short video that takes an animated look at ICANN's 5–year Strategic Plan which sets forth five Strategic Objectives and sixteen Strategic Goals, each with Key Success Factors and Strategic Risks. Five-Year Operating Plan – Developed with community input and updated annually. Annual Operating Plan & Budget – Derived from the Five-Year Operating Plan and from community input. Achievement & Progress Reporting – Communicate performance metrics through the Portfolio Management System, Dashboards, and Quarterly Stakeholder Calls, etc., in support of the multi-stakeholder model of Accountability & Transparency. Stakeholder consultation and input is critical and feeds into every aspect of this plan. ICANN will report back to the community against these plans via Quarterly Stakeholder Calls. * Previous ICANN Strategic Plans have been archived here.